Representative Bolger strongly opposed spending millions on an unnecessary new State Police Headquarters. Bolger's Common Sense Solutions in Action. 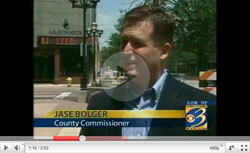 Jase Bolger has demonstrated he has the courage to oppose special interests and work for us. State government is struggling because our families are hurting. He stood strong to control spending and make sure state government lives within its means. 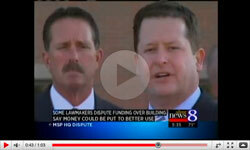 Bolger started 2011 with 10% pay cut to legislators. Passed the elimination of healthcare benefits for future retired legislators and the majority of current members, including himself. Bolger has never received a pension from the taxpayers, only a 401k. Cut his office budget as Speaker by 23%. Changed healthcare contributions for House employees, capping the amount paid by taxpayers. Passed Bridge Card (welfare) reform by banning the use of bridge cards by felons, at casino ATMs or for tobacco, alcohol and lottery ticket purchases. Opposed the spending of state money to set up health exchanges, as required by Obamacare. Eliminated more than 200 unnecessary and obsolete regulations. Protected seniors over age 67 from paying a pension tax.